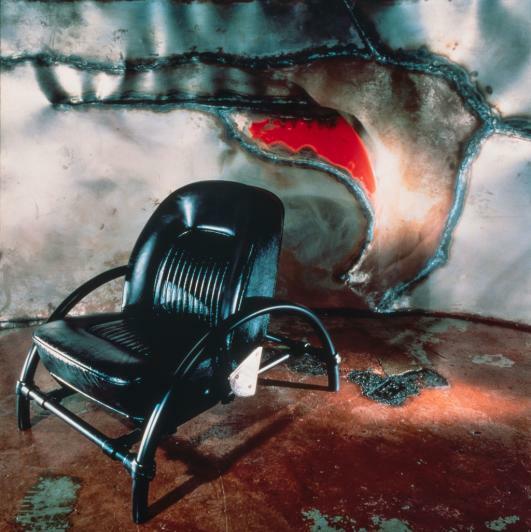 Readymades constructed from old car seats, innovative carbon fibre furniture, hand-welded steel furnishings and sculptural mass-manufactured products: works by the world-famous designer Ron Arad defy conventional boundaries. 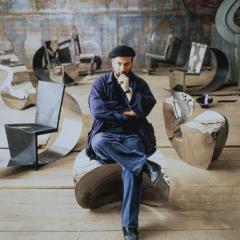 The Vitra Design Museum’s monographic exhibition »Ron Arad: Yes to the Uncommon!« gives an overview of his diverse oeuvre. This presentation at the Vitra Schaudepot includes numerous early designs from the 1980s, whose raw energy established Arad’s international reputation as a rising star. The show also includes more recent objects resulting from the direct transfer of his experimental approach to serially manufactured products. 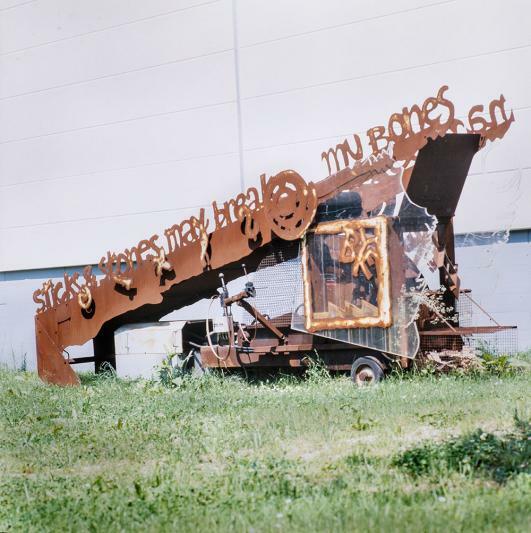 The spectacular machine »Sticks and Stones« (1987) is a highlight of the exhibition in Weil am Rhein. By »eating« chairs and metal objects and then disgorging them in the form of pressed cubes, the contraption performs an act of deconstruction through which Arad casts a critical light on our consumer culture while also questioning the role of the designer. Just recently restored, the machine will be put into operation for the first time since the early 1990s. It will be on display in front of the Vitra Schaudepot for the duration of the exhibition. Ron Arad was born in Tel Aviv in 1951 and studied at the national arts academy in Jerusalem and the Architectural Association in London. After completing his degree in 1979, Arad worked for a short time at an architectural firm in London. One day he left for lunch and never came back: this consequential decision marked the beginning of an exceptional career, which has been characterised by an incessant pursuit of freedom and unconventional paths. Arad constructed his first design object in 1981 by attaching pipe couplings to a Rover 90 car seat he had found at a scrapyard. Reminiscent of Marcel Duchamp’s readymades, the »Rover Chair« drew Arad’s focus to the field of design. In the same year, he co-founded the studio One Off (1981–1991) with Caroline Thorman and began to experiment with materials like concrete and steel. With their rough, weighty aesthetic, works from this early creative period often convey a subversive design approach, such as the »Concrete Stereo« (1983) or »Horns Table« (1985). Also featured in the show is the »Tinker Chair« (1988), formed out of welded sheet steel and hammered into the desired shape. This object belongs to the famous furniture series Volumes, along with such iconic pieces as »Big Easy« (1988) and »Little Heavy« (1989). Some of these designs were later reinterpreted in different materials for the Italian furniture company Moroso. Additional objects on display include the »Well Tempered Chair« (1986), completely constructed from bent sheet steel, and the »Bookworm« bookshelf (1993) – probably Arad’s most famous design – which was originally made of tempered steel and later released commercially in a PVC version by the Italian furniture manufacturer Kartell. Arad’s oeuvre not only breaches the traditional boundaries between art, design and architecture – time and again, he has made his experimental, rebellious concepts accessible to serial production methods and, by extension, to the mass market. 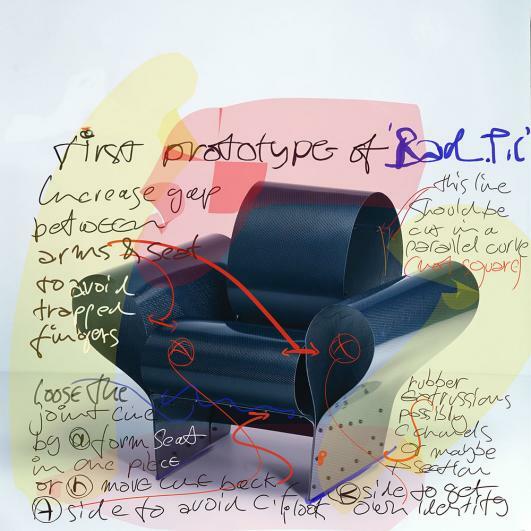 The exhibition presents examples like the »FPE Chair« (1997) for Kartell or Vitra’s »Tom Vac armchair« (1997), illustrating the connection between these highly successful industrial products and earlier works by the designer. Today Arad’s London studio, Ron Arad Associates, is active in the fields of product and furniture design, interior design and architecture. The firm has gained renown for such architectural works as the new Design Museum Holon (2006–2010) or the interior of the Watergate Hotel (2012–2016) in Washington, D.C. These examples also demonstrate Arad’s affinity for voluminous shapes, raw materials and sweeping curves: in today’s design world, with its high degree of commercialisation, there is still a place for maverick creations that evade prevailing expectations.